The Skeptic Zone has featured Maynard as a regular contributor for quite some time, and I have noted that I believe he is a good addition to the cast. His seasoned interviewing skills and quick wit are appreciated. However, lately the show seems to be drifting from The Skeptic Zone with a segment called Maynard “Spooky Action from a Distance” to the Maynard show with the Skeptic Zone friends. This is not a slight against Maynard, I still enjoy his segments, but lately the show has veered into a different feel. It has been awhile since “Grain of Salt” has aired for example or even "Dr. Rachie Reports." This could just be a blip in the continued run of the show, but I do think a correction is necessary. While shows do evolve over time, this would be as if Willie Geist took over two thirds of the segments on Morning Joe for the last three or four weeks. Righteous Indignation as of late has centered on Hayley Stevens and Marsh as it is widely known Trystan Swale has a newborn in the family which surely has his world turned upside down. I do miss the prolonged banter of Hayley, Trystan, and Marsh humorously, yet thoughtfully discussing skeptical topics of the day. The show seems to leaning on interviews to make up for the lack of the panel discussion portion of the show. This is not all bad as the latest episode featuring a full length and uncut interview with psychic (in communicating with the dead variety) Vicky Mason was absolutely a must listen event for any skeptic. Marsh and Hayley’s interview of Mason starts as fairly typical other than Ms. Mason is rather charismatic and seems to be a pleasant person. When Mason agreed to do a reading of Marsh and Hayley on the spot, the episode became quite interesting and exceedingly educational. Mason proceeded to perform a rather blatant and at least to me unintentional cold reading. Various names were dropped, references to a small white dog, which at the time seemed a reference to skeptic dog Lucky Stevens. * At points it became uncomfortable in how unimpressive the read was on Marsh and Hayley. However, I do believe Ms. Mason was genuine and was not putting on an act. I could be wrong, but that is my impression. Hayley and Marsh did not do any “ah-ha” moments and were appropriately respectful throughout the read. In the end, the Indignates have recorded and shared a textbook cold read for the skeptic to learn and ponder. Also, Stevens has begun a new series of her recollections on her well received Rather Friendly Skeptic Blog of her believer days as a ghost investigator, which after the first one seem to be something non-verbal to look forward from time to time. Finally, Karen Stollznow had a quite interesting interview with Robert Schaeffer - author, columnist of "Skeptical Inquirer," and blogger on Bad UFO with a thirty year-plus history of skeptical activity. Schaeffer discussed some good old meat and potatoes skepticism on conspiracy theories, waves of various question beliefs through the years, and how UFO lore has changed over the past sixty years. No new ground was broken, but it was a quite pleasant thirty minute listen. *Lucky is Hayley beloved dog, and I like to think of him as a skeptical massquot. 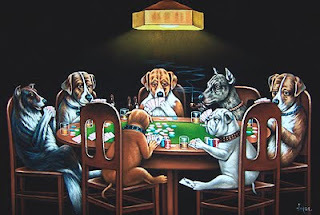 On a random note, someone needs to do a painting of pets doing skepticism ala the popular dogs playing poker motif. Perhaps Lucky, Ike, Pip and Pod in a lovely velvet painting might make a nice collector’s item someday.